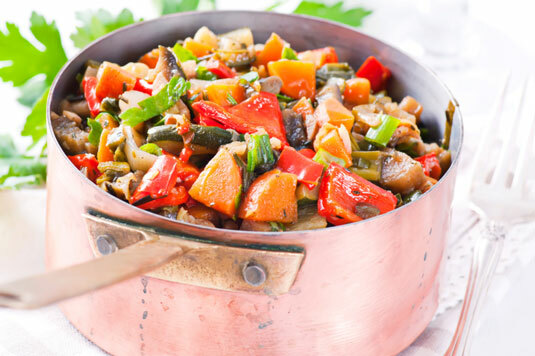 Ratatouille, a hearty vegetable casserole from the Provence region of France, is made with the brightly colored and flavorful vegetables the area is known for. This dish is hearty enough to be served as a main course with salad, cheese, and thick slices of country bread or as a side dish with grilled meat, poultry, or fish. Place the eggplant in a colander. Sprinkle with salt and let sit for 30 minutes to drain off any acidity. Heat 1 tablespoon of the olive oil in a large, covered skillet over medium-high heat. Add the zucchini and cook until soft, about 4 to 5 minutes. Season with salt and pepper. Place in a bowl and set aside. Heat another 2 tablespoons of the olive oil in the skillet. Add the eggplant and cook until soft, 6 to 8 minutes. Place in the bowl with the zucchini. Add the remaining 2 tablespoons of olive oil to the skillet. Add the red and green peppers, onion, and garlic and cook until soft. Add the diced tomatoes, season with salt and pepper, and cook for 5 minutes. Add the cooked zucchini, eggplant, and bay leaf. Cover and cook for 20 minutes over low heat. Remove the bay leaf. Taste and add salt and pepper if necessary.